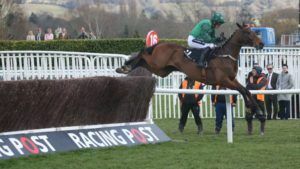 This week the Racing Post website carried a photograph, by John Grossick, of Footpad jumping to victory in last season’s Arkle Novices Steeplechase. He is captured mid-air, in striking fashion – like a startled hare or a running dear, all power and speed, unleashed like a giant spring. The remarkable thing about the best racing photographers is that they capture, in a still image, the explosive power of a firework – frozen in time and yet bursting with energy. And that’s what I love about this time of year: The Gunpowder Plot. Remember, remember the 5th of November – bonfires, fireworks and the all the excitement of the forthcoming jump racing season. I don’t know about treason (the Government is doing quite a good job of bringing itself down without any additional help from treasonous rebels), but there are plots aplenty. Elsewhere in the press, Sue and Harvey Smith explained that they weren’t too disappointed about Vintage Clouds missing the cut for the Grand National last April – he’s stronger now and with a small rise in the weights (for finishing third in the Scottish National) he’ll be in prime position to take full advantage in the 2019 running of the Aintree feature. The largest ‘chocolate firework’ in history was 3 metres high and half as wide, containing 60kg of Swiss chocolates which it distributed across Zurich on New Year’s Eve 2002. Similar treats are falling, like confetti, all around us this weekend. The Charlie Hall Chase at Wetherby heralds the starting point of the season for, among others, Definitely Red, Black Corton and Double Shuffle. Over at Ayr, also on Saturday, several previous Kelso winners are in action including Shades of Midnight (who looks destined to return to Kelso for the Paris Pike Novices Chase on Sunday 9th December), Golden Jeffrey and Taxmeifyoucan. This week’s selection, however, is Martila – the Pauline Robson trained mare who has been placed at Kelso but, more importantly, won this same valuable handicap hurdle prize at Ayr last season.